By getting involved with TSDF, you are helping to provide deaf and hard-of-hearing children throughout Texas with the education they deserve. Your generosity helps to fill the gap between funds provided by legislative appropriation and what is truly required to give these children the specialized programs and essential resources they need to learn, grow, and belong. TSDF offers a variety of opportunities for you and/or your business to engage with our mission: to strengthen and sustain language, academic achievement and career pathways for deaf students at TSD and across Texas. As an individual, you can invest in the children of TSD by donating, including matching gifts, memorials/honoraria, planned giving, and vehicle donation, as well as attending or volunteering at a special event. Read below to learn more. You can enhance your company’s presence within the community, while also enhancing the learning opportunities and lives of more than 7,000 deaf and hard-of-hearing children across the state of Texas, by joining one of three TSD Foundation Partnership categories: Underwriter, Event Sponsor, or Community Partner. No matter how you get involved, your support will make a real difference in the lives of children served by TSD today, so they can each have a better tomorrow. Please give generously, knowing your support matters. Thank you! Click on any of the blue buttons or tabs below to learn how you can help or contact Holly Hawk, Executive Director, at 512.462.5750 or holly@tsdfoundation.org. The Texas School for the Deaf Foundation is a 501(c)3 non-profit organization. All donors will receive a tax deductible receipt in the mail. Our tax ID Number is: 20-1867184. Your gifts to TSDF help to enhance learning opportunities for more than 7,000 deaf and hard-of-hearing children in Texas! If your company matches charitable donations, you can double your impact simply by requesting a matching gift form from your employer and sending the completed/signed form, along with your donation, to us at Texas School for the Deaf Foundation, P.O. Box 42727, Austin TX 78704. We’ll take care of the rest. You can honor or memorialize a friend or family member while also making a difference in the lives of the children who are served by TSD. Upon receipt of your Honorarium or Memorial gift, we will inform the honoree/family of your generosity with a personal note. To begin the process, just fill out the form below or contact Holly Hawk, Executive Director, directly at holly@tsdfoundation.org or 512.462.5750. To learn more about how you can create a lasting legacy for the children served by TSD, please contact Mark Seeger, mseeger@fastmail.fm or Danny Lacey dcladvisor@gmail.com and ask about our planned giving program and how you can Leave A Legacy. Did you know you can donate your car, truck, van, SUV, motorcycle, boat, RV, ATV, trailer, or airplane and receive a tax deduction? You could free yourself from the hassles of getting rid of an unwanted vehicle, while also making a difference in the lives of 7,000 children across Texas who are deaf or hard-of-hearing. 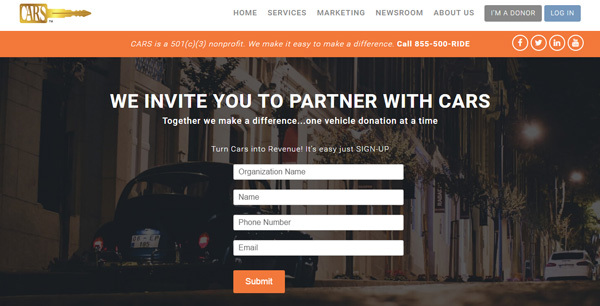 TSDF has partnered with Charitable Auto Resources (CARS) to make it easy for you to donate any vehicle. CARS donation specialists are available 7 days a week to guide you through the process. To get started, simply call their toll free number 877.537.5277, fill out the form below or visit their website. Let them know you want to donate your vehicle to TSDF. They will pick up your vehicle (for free!) within 24-72 hours of your call and provide you with a receipt confirming your tax deduction. Donate your vehicle today. It’s easy! It will be picked up and all the profits will go to support the children served by TSD!